Two inscriptions belonging to the reign of the Rashtrakuta King, Krishna III, were found at Vallimalai village in Vellore district of Tamil Nadu. Vallimalai is situated close to Melpadi village, which served as the military encampment of the king during the middle of the 10th century C.E. It is about 50 km from Takkolam, where the king defeated the Chola prince Rajaditya, son of Parantaka Chola I, in a battle in 949 C.E. The inscriptions — one in Tamil and the other in Kannada — were discovered by archaeologist K. Kumar while visiting Vallimalai two months ago. The Tamil inscription came to light when workers dug up a trench. Dr. Kumar, who has a Ph.D. in archaeology of the Vellore region in Tamil Nadu found the Tamil inscription engraved on a granite slab. When he and P. Venkatesan, Superintending Archaeologist, Archaeological Survey of India, visited the area a month later, they found the Kannada version. 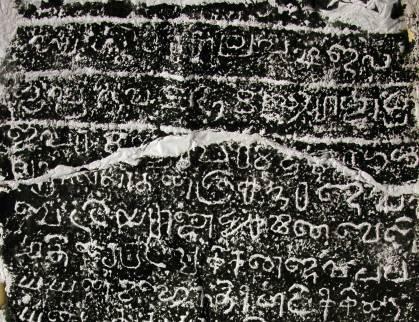 The inscriptions record that Krishna III, while camping at Melpadi (“Melpaadikku vanthirunthu,” as mentioned in the Tamil inscription) gifted Mahendrapadi as “jivitham,” after auditing the village accounts and exempting it from all imposts, to “Disai-idang Gaganadeva Appaiyan,” an immigrant from Karanjikheta area in the Krishna valley. The Kannada inscription says the endowment was made in the presence of Krishna III's feudatories, Rattas and Bitti Raja, who were staying at Melpadi. Krishna III was eulogised as Akalavarsha Deva, Prithvi Vallabha, Maha Rajathiraja, Parameshvara, Parama Bhattaraka and Chaleka Nallathan, indicating that he was yet to accomplish his conquests of Kancheepuram and Thanjavur as recorded in the later-day inscriptions issued by him, according to Dr. Kumar. The importance of these inscriptions, which are Krishna III's two earliest stone inscriptions discovered so far, mention his presence at Melpadi, a fact otherwise known only through copper plate charters, says Dr. Kumar. The Karhad copper plates in Kannada from Maharashtra talk about his distribution of the spoils of war among his men at his military camp at Melpadi after defeating Rajaditya in Takkolam. The Athakur (near Mysore) inscription of Krishna III's son-in-law, Bhutuga II, says Rajaditya was treacherously killed by Bhutuga II while Rajaditya was seated on his elephant. Bhutuga II took part in the Takkolam battle along with Krishna III. The Tamil inscription also says that Rajaditya was killed while seated on the elephant (“aanai mel thunjiya Chola deva”). The Karhad plates mention that one of the aims behind Krishna III's invasion of the Chola territory was to provide livelihood for his subjects. “These details known through the copper plate charters find a stunning confirmation in the recently discovered stone inscriptions at Melpadi. Hence, the discovery of these lithic inscriptions is important in the history of south India,” said Dr. Kumar. Vallimalai has two important Chola temples named Arinjikai Eswaram and Somanatha Eswaram, built by Emperor Raja Raja (regnal years 985 – 1014 C.E.). A small portion of the inscriptions is missing. They contain the image of Goddess Gajalakshmi at the top.